Angharad Price’s The Life of Rebecca Jones (translated by Lloyd Jones, review copy courtesy of MacLehose Press) is a beautiful little book, an elegant look at the life of a woman who has spent her whole life in a secluded valley in North Wales, the heart of the Welsh-speaking community. Part biography, part history, the book starts with the narrator at the end of her life at the beginning of the twenty-first century, from where we follow her back to the beginning of the twentieth century to see her mother and father returning after their wedding to their home in the valley of Maesglasau. This sets the scene for Rebecca herself to appear in 1905 (and on page nineteen). “Indeed a stream is not the best metaphor for life’s regular flow between one dam and the next. On the whole, Rebecca relates the ups and downs calmly, making a hard, bitter life sound calm and desirable. We always suspect, though, that there’s something more below the surface, just waiting to be uncovered. 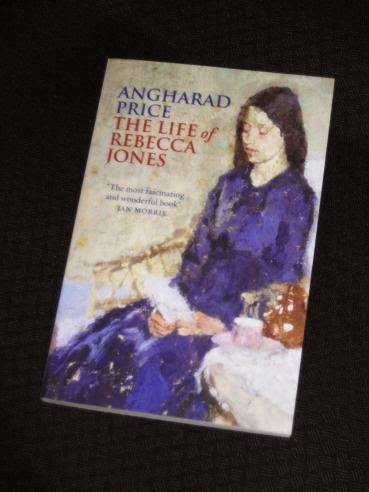 The Life of Rebecca Jones is a wonderful little book, and it’s already considered as a Welsh-language classic, despite having been written a mere dozen years ago. The original title (O! Tyn y Gorchudd, which translates to ‘O! Pull aside the Veil’) is taken from a hymn written by a resident of the valley centuries ago, but the significance goes beyond its writer. There’s an obvious nod towards the blind brothers, but there’s also a hint that our sight is also limited, with certain things beyond our view. While the plot, as it is, is fairly simply, the book is wonderfully descriptive. It opens our eyes to a life that seems light years away, but is, in fact very similar to that lived by our own grand-parents and great-grand-parents. The family live a life dictated by the elements, matters revolving around seasonal events such as harvest time and shearing. For those of us accustomed to supermarkets with an almost unlimited array of food, the idea of only being able to eat what’s in season (and only having fresh meat for a few months of the year) is a rather alien one. “At important times, such as shearing or harvest, Mother was expected to do her share of the tasks, in addition to preparing food and drink for a horde of men twice in a day. After clearing the table she’d go out to work again until sunset. Then she’d need to prepare supper for everyone and put us children to bed, after which she’d clean the tens of plates and dishes that had accumulated during the day. With the story being a mere succession of events, there’s a danger of the novel becoming pretty, but dull, but towards the end of the story, change is skilfully woven into the structure. Events move more quickly, changes become more obvious and progress rears its head – whether it’s an ugly or attractive one depends on your point of view. Certainly, many changes are welcome; the coming of electricity means that light can be had at any time of day, and the invention of the washing machine turns a day’s hard labour into an hour sitting chatting over a cup of tea. The Life of Rebecca Jones is a fascinating book and a rather personal one for the writer. Angharad Price is actually Rebecca Jones’ grand-niece (and is mentioned once by name in the book), and the majority of what happens in the book is simply a factual account of her family history. However, there’s a twist in the tale, and her work is an example of Sebaldian intermingling of real life and imagination, family details and black-and-white photos twisted around a liberal dose of imagination and some elegant writing. I've come across this book several times but your review really makes me want to read it. The aspect you mention of modernisation arriving in secluded parts of the English (or Welsh) countryside reminds me a bit of Laurie Lee's Cider with Rosie, but I don't know how far that's a valid comparison. Tony – great review of a memorable book. I read this some time ago, but it's a work that has really stuck with me. seraillon – Thanks 🙂 It's a wonderful little book, one I'd had my eye on a for a while, and I'm glad I finally got around to trying it. I hadn't come across this book until I read your review and it sounds excellent. A close friend would love this, I'm sure – her family has lived in Wales for generations, so I'll pass along your post.